Subaru keeps making great cars for people who love cars that are practical, comfortable, safe and reliable. 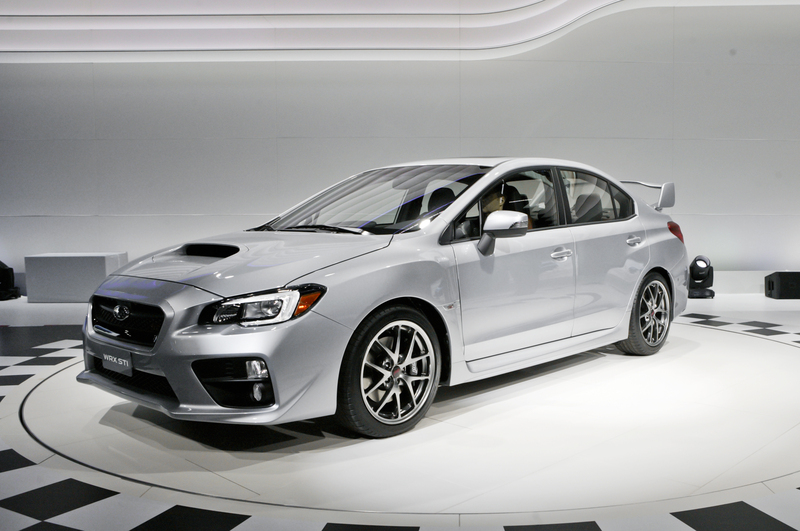 Brand new, and top of the performance tree, is the new Subaru WRX STi that comes with a short-shifting six-speed manual gearbox that flicks between the gears quickly and with ease. One of the best Subaru designs for some years (my opinion), the WRX STi has a particularly striking front nose that looks aggressive while retaining a tone of elegance. Prominent LED headlights with a halogen high-beam arrest the onlookers, while at the rear of the small sedan are LED rear lights, an aerodynamic rear spoiler, and a shark fin antenna. Sitting on attractive 17-inch charcoal alloy wheels (18-inch optional), this is a Subaru WRX STi that’s on some serious business. Slip inside, and both STi models are comfortable, modern and safe. The new WRX STi has a strong 5-star safety result – the best you can get. There is lots of black in different shades forward of the driver. The result is a smart, coherent design that also ensures that the driver’s attention is purely on the road ahead. Vivid red is used for highlighting; the gauges and the stitching for the leather seats have the red, and the result is very attractive. Some of the features that aid the WRX STi gaining the full 5-stars in the ANCAP testing are the premium symmetrical All-Wheel-Drive and the new updated Vehicle Dynamics Control system (VDC). The VDC uses an array of highly advanced features like Electronic Stability Control (ESC), an Anti-lock Braking System (ABS), Electronic Brakeforce Distribution (EBD), Brake Assist and a Traction Control System (TCS) to keep fully in touch with the road surface. The traction control uses a special TCS Limited Slip Device for greater control. The Subaru WRX STi offers 3-mode VDC reality, where the driver can choose between Normal mode, Traction mode and Off mode (Off mode is for the really skilful drivers). An Active Torque Vectoring system monitors the amount of engine power taken to all four wheels, while SRS airbags – dual front, dual front side and curtain SRS airbags lead the way in passive safety features. The front seat belts have pretensioners and load limiters. Out on the road, the new Subaru WRX STi feels very agile and beautifully in control at all times. It’s an easy car to drive fast, and with Subaru’s Intelligent Drive (SI-DRIVE), the driver can get the full benefits of the WRX STi chassis. The driver can choose between Intelligent mode (I), Sport mode (S) and SportSharp mode (S#). Massive brake discs ensure massive braking ability, and you really do stop quicker than this thing accelerates. Subaru claim a 0-100 km/h sprint of 4.9 seconds! Just as well the Brembo discs in the front and rear of the WRX STi are potted and ventilated for premium stopping power. A close ratio six-speed manual gearbox connects with the engine revs beautifully to make the new Subaru WRX STi a really fast drive. The 2.5-litre turbocharged horizontally-opposed Boxer 4-cylinder, petrol engine puts out 221 kW at 6000 rpm and makes a maximum of 407 Nm of torque at 4000 rpm. Fast and practical, the Subaru STi has five seats and 460 litres of boot space which means the performance of the new WRX is matched with a useful level of practicality. 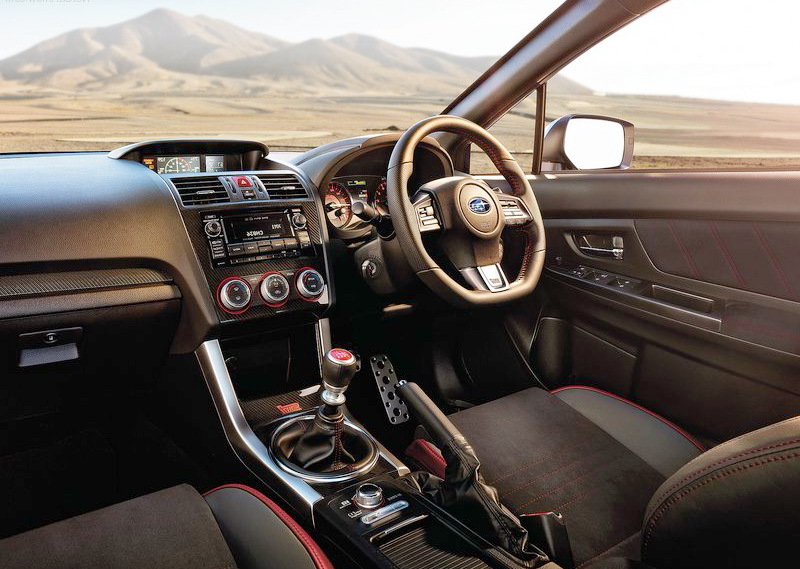 Not only is the WRX STi drive sensationally fast, there are many nice features to make the drive comfortable and enjoyable for all occupants. A rear view reverse camera, dual zone climate control, and audio, cruise control, Bluetooth communications and an MID system are part of both STi model repertoires. Drivers can control the audio, cruise control, Bluetooth and MID system via the switchgear on the steering wheel. Enter and drive the all new Subaru WRX STi models via the Smart key and push-start ignition. The trim on the strikingly good-looking seats is an Alcantara material with leather accents. The Sports bucket seats have red stitching and an embroidered STI logo. The driver’s seat is 8-way adjustable and heated. All occupants are going to enjoy the level of features on-board both STi models. The multi-information in-dash satellite navigation system helps you find your way but it also has other features to make the drive fun. An awesome harman kardon sound system with eight speakers and an amplifier make superb music, and there is an audio streaming function. The voice command recognition makes the car even more entertaining to drive. An auxiliary jack is available in the front centre console along with a USB connection point. Being a special performance sedan, it is great to see Subaru standing by their engineering and design with a 3 year/unlimited km warranty on all Subaru WRX STi models. Seven exterior colours are available – my pick is the striking new Lightening Red. For any more information on the Subaru WRX STi, or for that matter any other new car, contact one of our friendly consultants on 1300 303 181. If you’d like some fleet discount pricing (yes even for private buyers! ), we can submit vehicle quotes requests out to our national network of Subaru dealers and come back with pricing within 24 hours. Private Fleet – car buying made easy!